No soccer player has scored more goals as a representative of the Japanese national team. No Olympian in the 1968 Mexico City Games scored more goals. Currently a member of the Japanese government’s House of Councilors, Kunishige Kamamoto (釜本邦茂) is considered the greatest Japanese soccer player of all time. As a student at Waseda University, Kamamoto was one of the youngest players on the Japan national team that competed in the Tokyo Summer Games in 1964. Despite winning their first match against Argentina unexpectedly, in which Kamamoto assisted on the winning goal, the Japan team lost their next two matches against Ghana and Czechoslovakia to fall out of the running for a medal. And Japan lost in the consolation rounds to Yugoslavia, to end up eighth in the standings. But in the match against Yugoslavia, the striker from Kyoto scored the only goal in a 6-1 loss. It was his first goal in Olympic competition. But it wasn’t his last. The coach of the Japan national team, Dettmarr Cramer, believed Kamamoto to be world class. In fact Cramer was influential in getting Kamamoto experience in Germany with a German football club as well as with the German national team in the beginning of 1968. 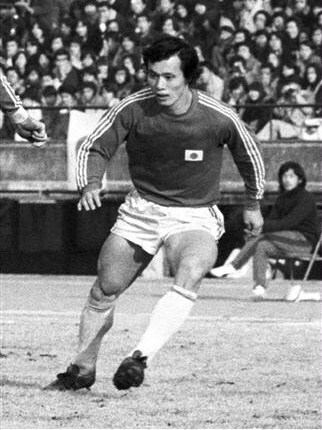 Kamamoto then joined the national team in the Mexico City Games in 1968, scoring a total of 7 goals, the only Asian ever to be the top scorer of an Olympic Games. He led the team to victories over Nigeria (where he had a hat trick), and ties with Spain and Brazil. In the medal rounds, Japan defeated France 3-1, in which Kamamoto netted two goals. While they were shut out by eventual gold medalists, Hungary, to finish out of the championship match, Japan fought off host Mexico in front of 105,000 people to win 2-0. Who scored those two goals in the first half to quiet the crowd? Kunishige Kamamoto. Unfortunately, Kamamoto was sidelined due to hepatitis for a considerable amount of time after the Mexico City Games, and the Japan team wasn’t able to advance to the World Cup. Additionally, Japan did not have a professional league to take advantage the momentum Japan’s national team generated in Mexico City. But eventually the Japan Soccer League was formed and Kamamoto became the highest scoring player in that league’s history, with Yanmar Diesel. Kamamoto on the shoulders of Pele and Wolfgang Overath at his retirement match in Tokyo on August 25, 1984. I looked back on negatives of similar photographs taken by two cameramen to record all of his matches throughout an entire year. It was astonishing to see just how this player’s approach to the ball, steps, impact, and follow-through when shooting were always exactly the same. His technique and posture when heading was similar – always stable and beautiful – from his vision to ready himself for the moment the crosser played the ball, to his determination of the ball’s point of fall, his steps, his jump, and finally his contact with the ball in the air. His body was unusually well-built for a Japanese, he had developed his own precise techniques for shooting and heading, and he knew how to use all of this to help his team, but the area in which Kamamoto had the most self-confidence of all was his ability to shoot and simply kick the ball. Having played alongside men such as Johan Cruyff, Michel Platini, and Bernd Schuster in the World Select XI in Barcelona, Kamamoto said “seeing players like these showed me just how good the world’s best footballers really were. Having said that, I still thought that I could shoot and kick the ball at least as well as any of them”. Posted in Field Sports, Japan, Other Olympics, Tokyo 1964 and tagged 1964 Olympics, 1968 Olympics, Dettmarr Cramer, 釜本邦茂), Kunishige Kamamoto, tokyo olympics. Bookmark the permalink.